In this era of the autonomous Airbnb, it’s easy to forget the comforts of a good, old fashioned Bed & Breakfast Inn. 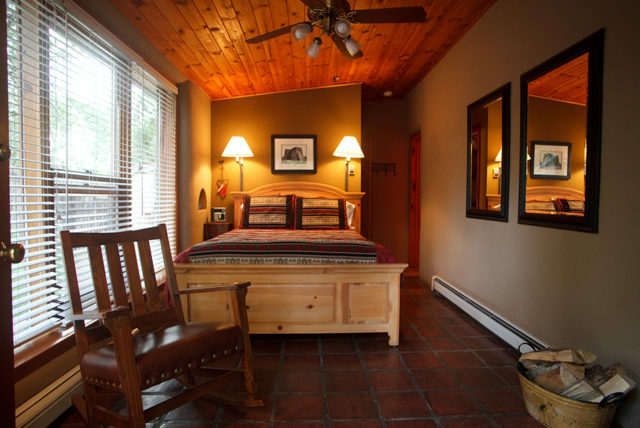 Situated in a tree lined neighborhood that could be way out in the country, but is right in town, the Dreamcatcher B&B offers classic Taos charm and comfort. The new owners – Mary Beth and her husband Boyd – intend to carry on the tradition of being a welcoming home away from home for the many return guests, who book their favourite rooms at Dreamcatcher, year after year. The couple, who are from Buffalo, New York, are recent empty nesters, following a dream of their own. “Or his own,” Mary Beth quipped when we spoke recently. “Boyd has wanted a B&B forever!” She laughed. Boyd, an attorney who still practices remotely, and Mary Beth, a nurse practitioner, were ready for a change, and the West beckoned. They saw the Dreamcatcher and knew immediately it was exactly what they had been looking for. “It was our dream come true.” She smiled. 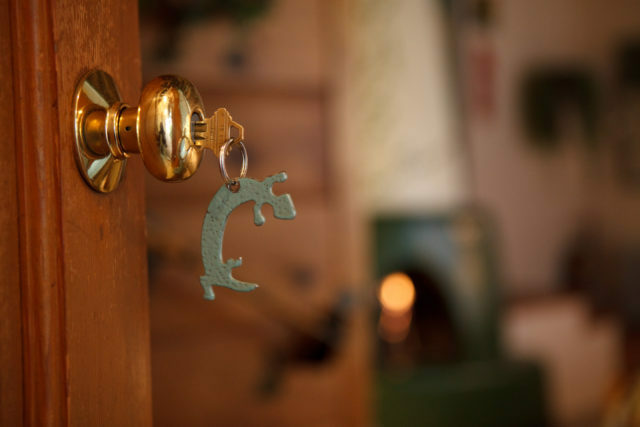 When the former owners, John and Prudy Abelin bought the Dreamcatcher, it had already morphed from a private home, built during the 40’s, to the Ruby Slipper – its first iteration as a Bed and Breakfast Inn. 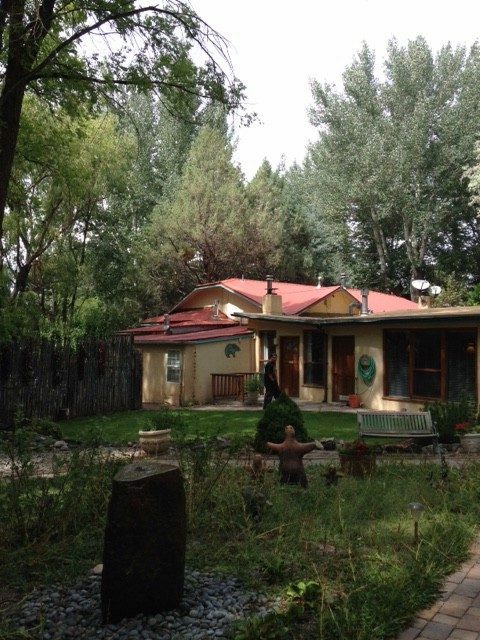 The owners prior to John and Prudy, had added casitas to the existing property, which is verdant and lush in the Summer months negating everything you imagined about the High Desert. 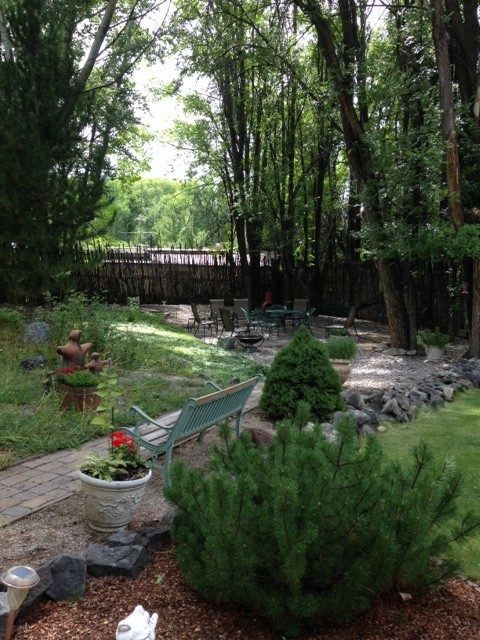 The entire area changes and delights with the Seasons, inviting one to leave one’s room and go outdoors. 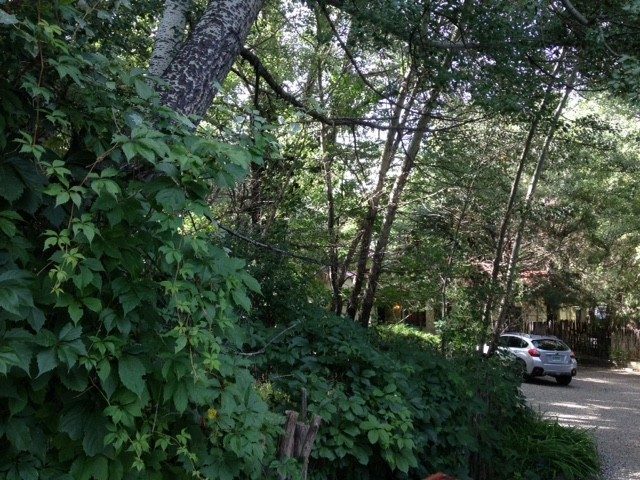 Find a spot under one of the old, shady trees to linger with a book, or simply sit and watch the myriad species of birds who also call this neighborhood home. Mary Beth and Boyd are already at work further enhancing the property’s beautiful gardens with more landscaping and hardscaping, including an outdoor fireplace. More outdoor “rooms” are being envisioned, along with hammocks in the aforementioned trees, where one can lazily spend a warm afternoon. 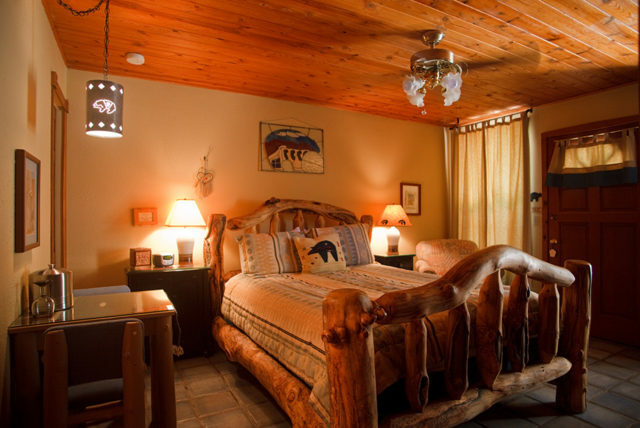 Dreamcatcher’s rooms are decorated in classic Taos Style. Carved wooden beds covered with South West weavings, Kokopellis and other familiar motifs associated with the area, abound. A wall in one of the suites is painted with a mural of hollyhocks by the late, beloved local artist, George Chacon. All the rooms but for two, have working Kiva fireplaces and all open onto the large and courtyard behind the main house. No detail has been overlooked. There are coffee makers in every room, along with lovely amenities in the bathrooms and fluffy robes in the closets. 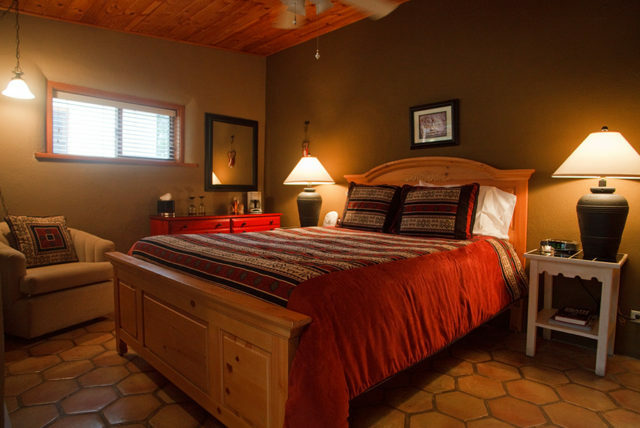 Prudy and John added modern decorative touches ; slighty retro arm chairs – some upholstered in bright leather hues – add comfort and style to the rooms and give a knowing nod to the adobe’s vintage provenance with their sleek mid-century design. Mary Beth and Boyd have also made a few changes to the breakfasts they serve daily, including more local, organic produce, bought at the Farmer’s Market. Once the Market ends in October, they intend to keep buying the fresh meats and eggs from the vendors directly. The couple like the former owners (who have become fast friends), love to travel. “It could be rented out as well when not on the road,” she said. “We are a bit adventurous,.” She laughed. And resourceful! The couple also have a place in Ecuador where they spend time whenever they can, and rent out the rest of the year. The day I visited, they were busy with a zillion things; contractors and bookkeepers were coming and going, guests were leaving and arriving. Even as improvements were being made, the Dreamcatcher continued to operate smoothly, as if nothing had really changed at all. And on the surface, it appears exactly as it always has; a cosy and comfortable place to rest one’s head for a night or a week. Or longer. A couple of mornings later, I was on my daily walk around the neighborhood (the Dreamcatcher is just next door to where I live), and I ran into a couple walking their dog along the road, just as a peacock from the nearby Neem Karoli Baba Ashram crossed the street. They asked me about peacock and we chatted for a minute. They told me they have stayed at the Dreamcatcher each time they have visited Taos for almost twenty years! For them, it truly is their home away from home. Apparently they are not the only return guests, several have been coming back for years. Named for the Ojibwe talisman that has become synonymous with Native American Culture, sometimes referred to as “Sacred Hoops,” dreamcatchers were traditionally used to protect sleeping people, usually children, from bad dreams and nightmares. Native Americans believe that the night air is filled with dreams, both good and bad. When hung above the bed in a place where the morning sunlight can hit it, the dream catcher attracts and catches all sorts of dreams and thoughts into its webs. Good dreams pass through and gently slide down the feathers to comfort the sleeper below. Bad dreams, however, are caught up in its protective net and destroyed, burned up in the light of day. At the Dreamcatcher B&B, good dreams are a given! To discover more about the Dreamcatcher B&B please visit their site linked below this post for more pictures of the property, and much more information. September 28, 2018 in Stay.